MY MOST USED EYESHADOW PALETTE OF ALL TIME! THE ONLY PALETTE I HAVE EVER HIT PAN IN! 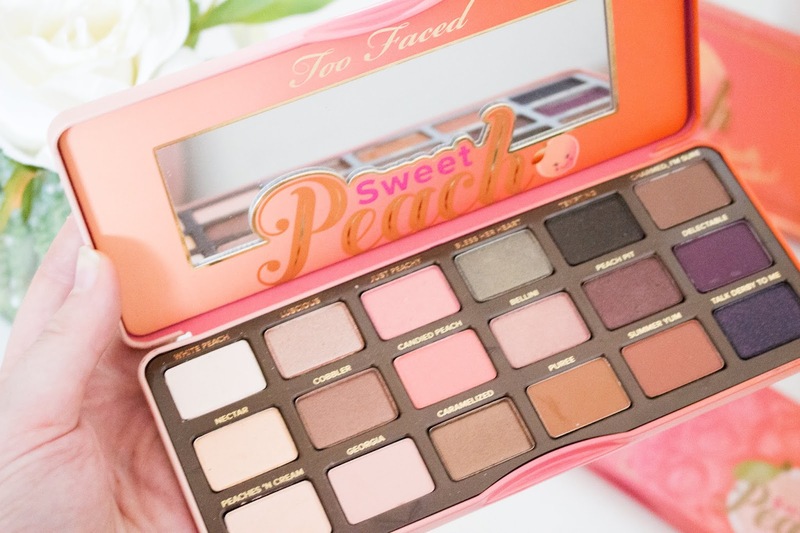 Too Faced is a brand that I have loved using for the last couple of years and I have mentioned them multiple times on my blog - from reviewing palettes to collections. 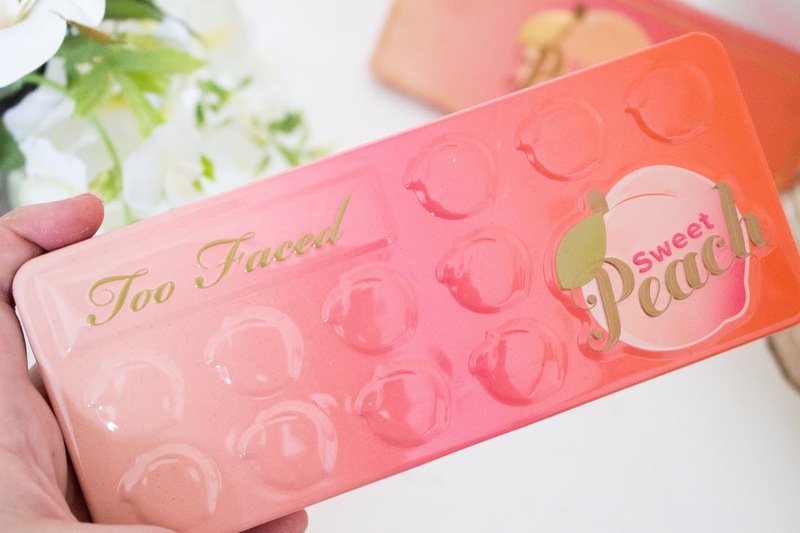 So, it came as a surprise when I was looking for a review of the Sweet Peach palette and realised I have never reviewed it (although I think it was briefly mentioned in a mini review series I did last year). Therefore, I think it is the perfect time to finally review this palette, once and for all, because it has been out for a couple of years and is probably the palette that I have reached for the most in the last year and a bit. I don't own another palette that I have hit pan on yet, so this palette must be pretty special. In fact, it is the only palette that I have ever repurchased - although there are other eyeshadow palettes that I will 100% repurchase if I ever hit pan on or when they expire. 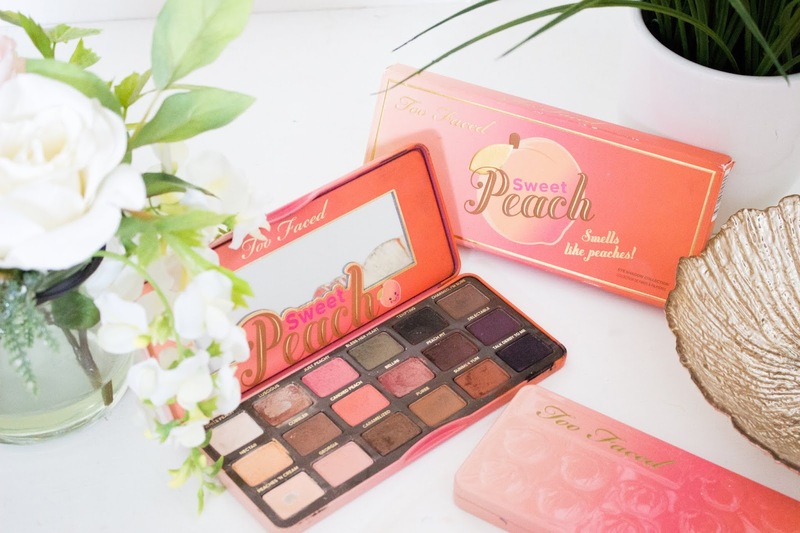 The Sweet Peach palette retails for £39 from Debenhams, Cult Beauty, Sephora and Too Faced. 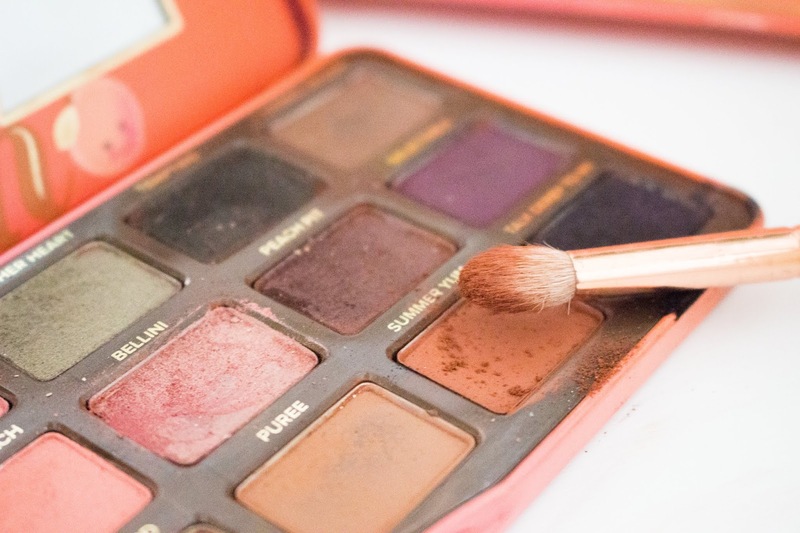 When it comes to eyeshadow palettes, there are certain shadows that will appeal to me more - for me, I am always going to want to buy any eyeshadow palette that is packed full of neutrals with caramel and peachy tones thrown in as well. So, of course this palette was an instant winner in my eyes! This palette first came out in 2016 and at the time it was limited edition. I never purchased this palette the first time it was released (but it sold out) and I couldn't justify a reason for buying yet another palette. However, when it was restocked a year later, I knew I needed to buy it. I loved this palette so much that I had to buy another one in case it was limited edition again, however it is now part of their permanent collection. 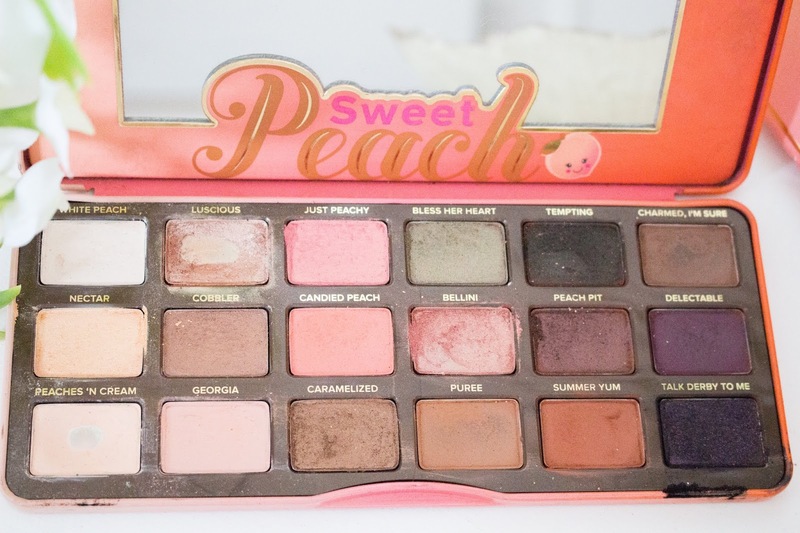 In this palette there are 18 gorgeous shades ranging from peachy pinks, corals, bronzes and purples. There are mattes, shimmers and satin shades, although I wouldn't say that the shimmers are too glittery which I really love. This eyeshadow palette is perfect for creating everyday looks and evening looks as there are so many shades in there that can be used to create so many different looks. I have worn this eyeshadow palette so much in the last year - I have use this to create looks for work, nights out, Christmas dos, weddings and so many more occasions because it is just the perfect palette. Plus I can create a look so quickly as the shadows all work well together. There is no other palette that I have reached for as much as this one. WHITE PEACH - a light beige satin that is perfect for setting eyeshadow primer or using as a matte highlight. It does not give much colour as it is more of a setting shade but it is really smooth and perfect for using as a base layer. NECTAR - a golden yellow frost that could be used as a highlighter (if you have a medium/tanned complexion). It is really opaque but best applied with either a finger of MAC Fix+ to get the best colour payoff. PEACHES 'N CREAM - a light peach/beige matte that I always use to set my eyeshadow primer when I am more tanned in the summer. It is not that pigmented on my skin as it is a similar shade but it is really buttery and perfect for setting primer. LUSCIOUS - a pearl peach champagne metallic that is stunning all over the lid. It is really pigmented and blends out beautifully. This would also make a lovely highlight shade if you have a medium/deep complexion. COBBLER - a peachy pink bronze pearl that feels more stiff than the others but blends out beautifully and just has a hint of shimmer to it. It looks more like a satin than a shimmer. GEORGIA - a peachy pink matte that is pigmented and blends out beautifully. This shade does have to be built up to get a really pigmented look, but it is soft and buttery. JUST PEACHY - a rosy pink shimmer which is absolutely stunning all over the lid for a really peachy look. This works best applied with MAC Fix+ and is quite sheer at first, but can be built up easily. CANDIED PEACH - a pure peach/orange micro-glitter which can look more matte as there is not much shimmer in it. This blends out really lovely and is really pigmented although does fade slightly throughout the day. CARAMELIZED - a bronze frost shimmer which is one of my favourite shades. It has a slight shimmer to it, but it doesn't look too glittery and is super soft and buttery. It blends out beautifully like the other shades. 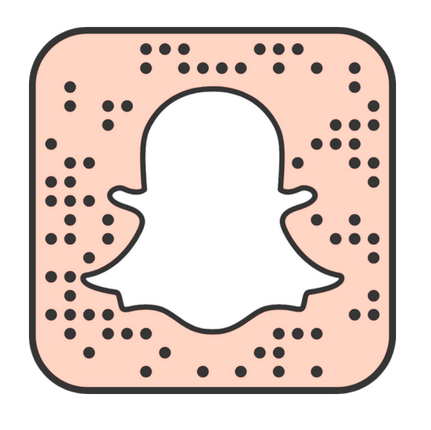 This is great for making an eye look look more smokey. BLESS HER HEART - an olive green frost shade that is quite sheer. It really needs a couple of layers to really build up the pigmentation. Plus it is not as soft as the others and seems to fade quite quickly. BELLINI - a peachy pink frost shimmer that applies well and has a nice colour payoff. This is lovely all over the eyelid and it just gives a really lovely shimmer to the eye. PUREE - a caramel brown matte that is easy to blend out. This is really the only transition shade that I use with every single look that I create using this palette. It is a lovely warm-toned transition shade and has amazing pigmentation. TEMPTING - a black/brown pearl which is really pigmented, but can feel quite dry. However, it applies really nicely to the eyes and smokes out any look instantly. PEACH PIT - a dark maroon pearl which is really buttery and has good pigmentation. This blends out really nicely too. SUMMER YUM - a warm toned brown matte that is amazing for deepening the crease. 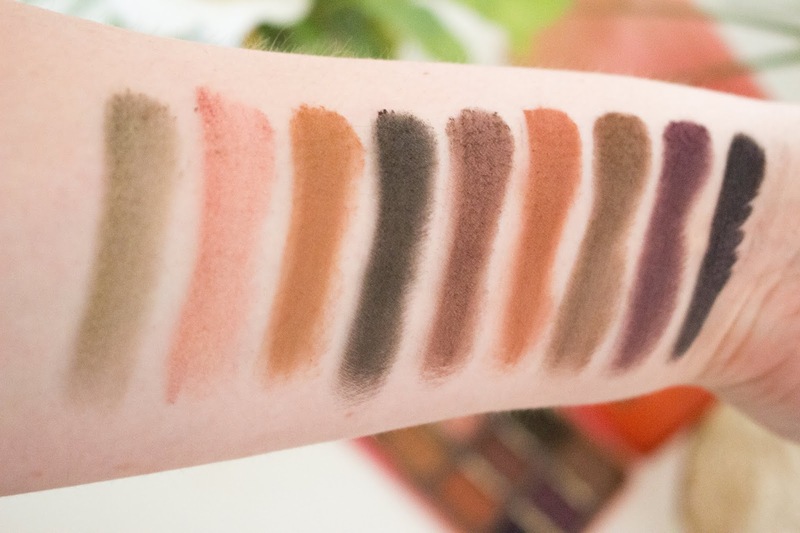 The colour payoff is great and it is really buttery and easy to blend out. CHARMED, I'M SURE - a dark brown matte that blends out easily but can be quite dry. DELECTABLE - a purple red satin that has a great colour payoff but is quite dry and can be difficult to blend out. TALK DERBY TO ME - a dark purple shimmer with a slight sparkle to it. This is quite dry in formula but has great pigmentation. It almost looks more like a black with purple glitters running through it. It is also quite powdery and is the only shadows that has some fall out and kick-up. I absolutely love these shadows and they are probably the easiest shadows to blend out. I have always loved the formulation of Too Faced eyeshadows and these shadows are just as amazing. Most of the shadows are really smooth and buttery to the touch, plus even the shadows that feel more dry (which I mentioned above) apply beautifully with a brush. I do find that once you have used some of the drier shadows for a while, they become more smooth and easy to use. Even though some feel dry, none of them are chalky and they have barely any fall out - besides the shade Talk Derby To Me. 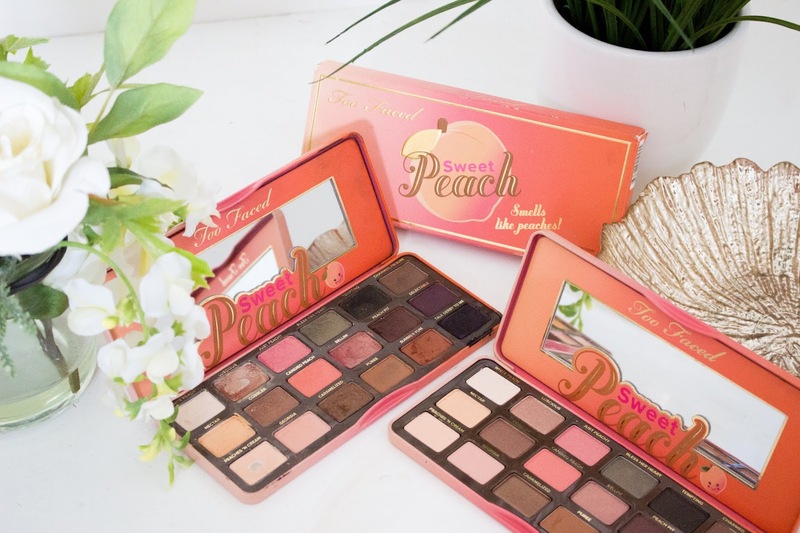 The shades that I love the most and have hit pan on are Peaches 'N Cream and Luscious as these are the shades that I use with most makeup looks. I can definitely see myself hitting pan on Summer Yum and Puree as they are also what I wear constantly in my crease as transition shades. There is very minimum kick-up in the pans when using a brush and I have found that there is barely any fall out either, so you can apply these after doing your foundation (although maybe put loose powder down first to catch any eyeshadow so it can be easily swipe off with a brush). The pigmentation of these shadows are amazing and most of them are really pigmented. Most of them are so opaque with just one coat from the brush, however there are some shades that are more on the sheer side. This isn't a big deal because all of them can be easily built up by applying another layer of pigment. I also love how easy these shadows are to blend out. I did find that synthetic brushes worked a lot better to pack pigment onto the lid but when I use a natural hair eyeshadow brush the colour was more soft and blown out. Most of the shadows swatched really well, however some do need more work when you use a brush with them. 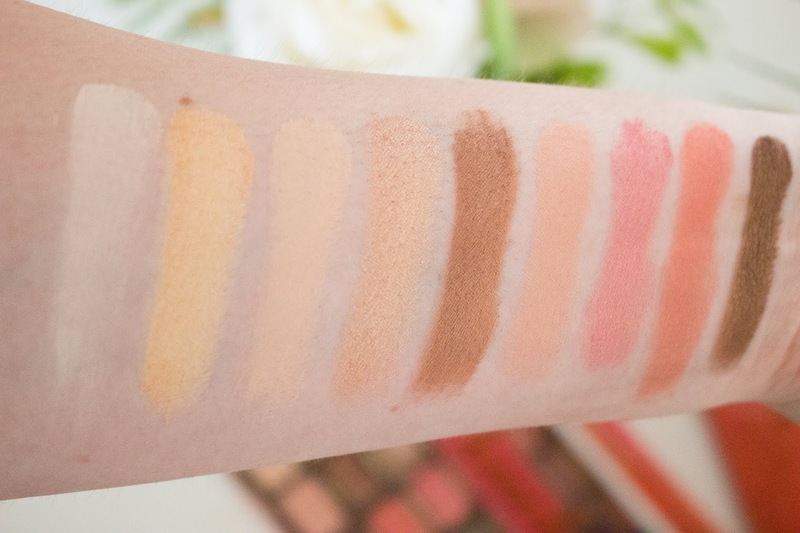 Also, swatches should never be relied upon - they are more to see what the shade will look like on your skin tone. Some shadows can swatch great and perform badly and vice versa. So don't focus too much on the swatches. I love the colour selection in this palette. All of the shades are so wearable and will work on so many skin tones. Although I do find that I don't really touch Bless Her Heart (a green), Talk Derby To Me (a black/purple) and Delectable (a red/purple) because they are not shades that I would usually wear on a daily basis. However, I have worn all of the other shades multiple times which is why they all look so well used. 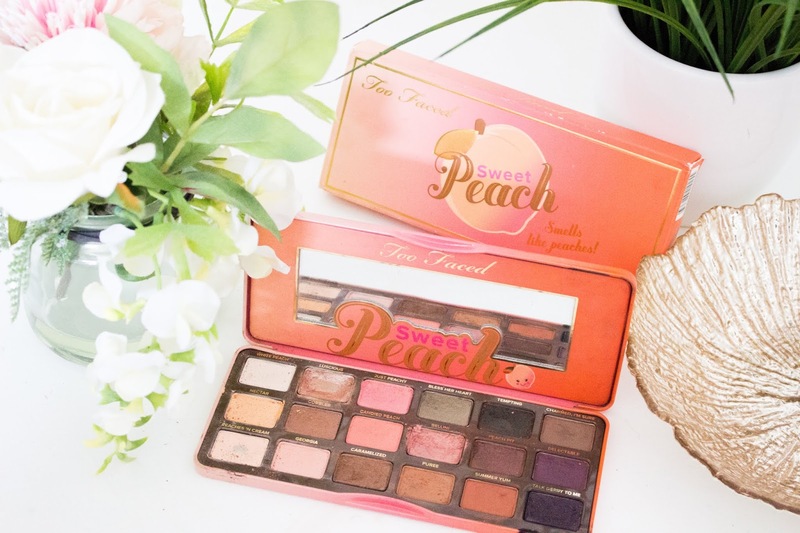 I love a peachy eye look, especially in the summer months. But this is not a palette that is just limited to being worn in the summer as I use this all year round to create pretty warm toned looks. My go-to look is to use Peaches 'N Cream all over the lid, then place Puree in the crease and slightly over the lid, the Summer Yum to help deepen the crease and then Charmed, I'm Sure in the outer corner. This creates such a beautiful neutral look that can be worn during the day and then I transform it into an evening look by placing Luscious all over the lid. This palette is so versatile and I can create so many different looks with just this one palette. This is also my go-to travel palette because it has so many wearable shades. Plus it is the perfect size palette to take travelling with me as it does not take up too much room. This is just the best eyeshadow palette for me as I reach for it multiple times, especially when I am in a rush and I want to make sure my eyeshadow always looks good! I do think that this is a palette that works best when you wear an eyeshadow primer or concealer underneath. I never wear eyeshadow without placing down some form of primer first so I never have a problem with pigmentation (usually)! I have found that this palette can work just as well without primer, however it will fade a lot quicker than if you were to wear a primer underneath. The intensity of the shades and the blendability of the shadows is just so much easier to achieve when there is a primer or concealer down first. I found that these shadows can last most of the day when you use a primer, before any fading, whereas without primer they last maybe a couple of hours at most. Therefore, an eyeshadow primer or concealer is your best bet for making your eyeshadow last all day and to make your eyes really pop! I also sometimes use MAC Fix+ or a concealer to make the metallic/pearl shimmer shades pop and look extra shimmery when I am going out. Personally, I think this eyeshadow palette is worth buying! Not only does this smell stunning as it has been infused with peach essence, plus it smells so much nicer than the Peaches & Cream collection, but the formula of these shadows are stunning too. There are also so many beautiful shades in this palette that can be used to create so many different looks that are perfect for any occasion. I just love the peaches, caramels and bronzes used in this palette and they come in matte, satin and pearl finishes which are beautiful. The formulation is really lovely as well and I never have a problem blending these shadows out. They also are all really pigmented and even the ones that are a bit more sheer can be easily built up to create an opaque finish. Some of the shadows are not as great and can be quite dry to the touch, however they work well on the eyes and they don't go patchy. This is the only palette that I have ever hit pan on - obviously I have not hit pan on every single shade but most of them are well used and will be hitting pan on them very soon. I love this palette so much and it is the one palette that I find myself reaching for time and time again. The only palette that would ever compete with this palette and I might hit pan on would be the Morphe x Jaclyn Hill palette as I use both just as much and they are both my favourite palettes, but I find the Sweet Peach palette is easier to create looks with as there are not so many shades. I will use all the shades in the Too Faced palette at some point whereas with the Morphe palette there are a lot of shades that I don't reach for. 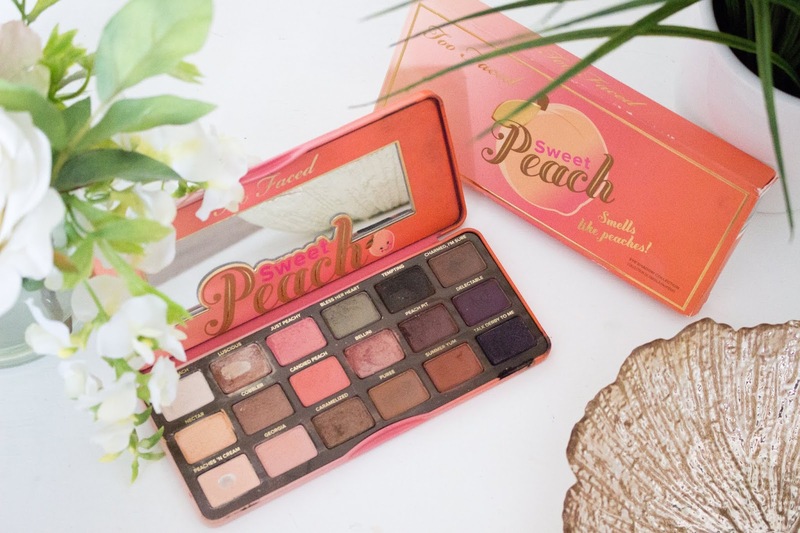 Therefore the Sweet Peach palette is my favourite to use! 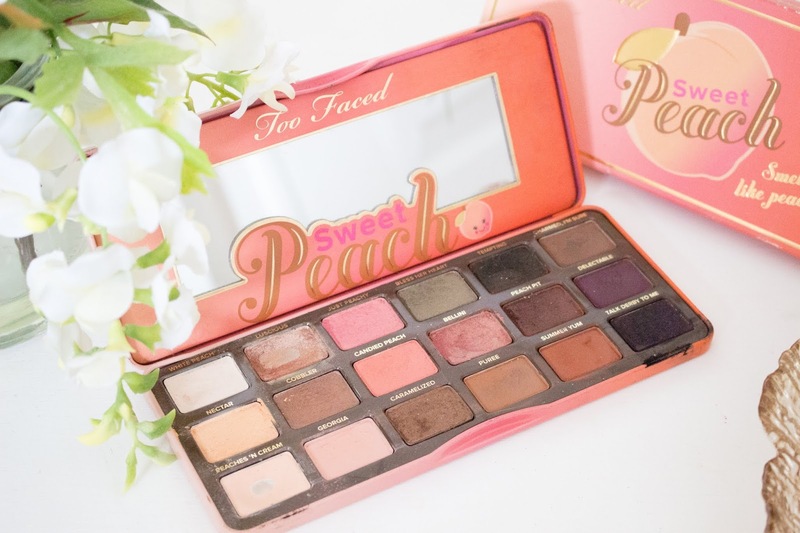 The Too Faced Sweet Peach eyeshadow palette retails for £39 and can be purchased from Debenhams, Cult Beauty, Sephora and Too Faced. Let me know in the comments whether you have this palette in your collection and what you think of it? What would be your most used palette in your collection?